Winners of LiteracyPlanet Legends 2017! LiteracyPlanet Legends celebrates the ‘legend’ in every child, and the special ‘legend’ moments in every student’s life. It highlights the synergy between physical activity, positive emotions and academic success, and celebrates kids’ achievements, big and small, in and outside the classroom. Being a Legend is not just about doing well at something, it’s about effort, perseverance, making a positive contribution to the community, and having fun. In Term 1, 2017, we invited parents and teachers to nominate their children and students, to celebrate their legend moments and give them the opportunity to win resources for their school. LiteracyPlanet received thousands of nominations, with hundreds of stories of remarkable students. Congratulations to all the nominees, who are to be commended for their achievements. Special congratulations to the final winners and runners up for each category below. Talia holds national, state, regional, district and club titles and records in track and field. She broke the Australian Little Athletics (u10 girls) discus record twice in one season, and beat a 35-yr-old record in the process. Since 2014 she has competed at regional, state and national level. She has achieved 45 championship titles; won 45 gold, 14 silver and seven bronze medals; and recorded 14 regional records, three Queensland pentathlon records, seven Queensland records, and one Australian record. Talia was nominated by her mum, who explains in addition to being a great sportswoman: “She inspires her peers to succeed against odds, and to overcome obstacles. She is gracious in defeat, humble in success, and often seen encouraging and mentoring others”. Brice was nominated by the Learning Leader for English at his school. He is a high academic achiever, who has topped his year in many subjects and recieved many awards including for English, Science, Music, Mathematics, citizenship and community contribution. But what stood out for the judges was his impressive effort last year when students at his school were invited to research a topic of their choice. Brice wanted to research something that made a difference, so he looked at the neuroplasticity of the brain and how this can be used to help others learn. He presented his research in the style of a TED Talk, which was shown at a whole school showcase. 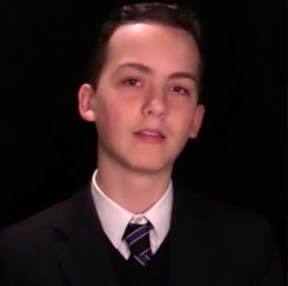 Brice’s school Principal says: “Brice is certainly an amazing young person and a gifted thinker”. 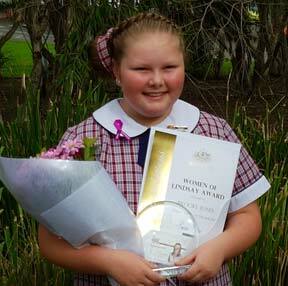 In 2013, at just 7-years-old, Brooke decided she needed to do something for the patients at her local cancer centre, and organised a one-off charity fundraiser "Brooke's Car Rally" to raise $300. She approached local businesses and people to gain support, and the event smashed its goal, raising $7,209. Following this success, Brooke decided to make the rally an annual event, and over the last few years it has raised a total of $40,600, which Brooke donated to the Nepean Cancer Care Centre and The Children's Hospital at Westmead’s Epilepsy Research Unit. This year, Brooke is hoping the 2017 Rally will be the biggest yet, and surpass $50,000 in funds raised. The fifth “Brooke’s Car Rally” will be held on Sunday, November 12, 2017. Good luck Brooke! 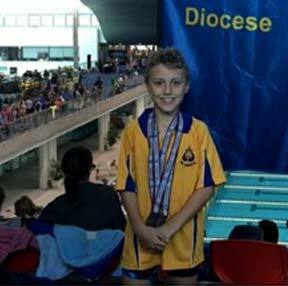 Matthew was nominated by a classmate’s mum, who was encouraged by her son to nominate his friend. 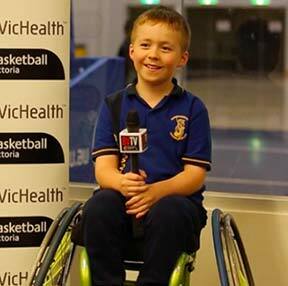 Matthew has cerebral palsy, a physical disability that affects body movement and muscle control. His friend’s mother explains he is “an amazing inspiration to all his class mates and all adults around him” who has “never allowed it (cerebral palsy) to get in his way”. Matthew has made it to the state competitons for both cross country and swimming, where he placed first and second in his races. He also does sports outside of school, recently competing in a triathlon. Not only a great sportsman, Matthew is modest, caring, and always encouraging others. Kai was nominated by his mum who explains that he struggled in his first few years at school, and they couldn’t figure out why. In Year 1 he was diagnosed with attention deficit hyperactivity disorder (ADHD) and after careful consideration, his parents decided to see if medication could help. Kai went from being a child who didn't enjoy school to being the first student to finish the work set by his teacher. He asks for more work, enjoys going to school and is happy. 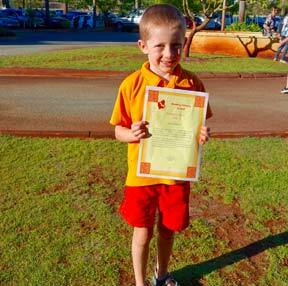 At the end of last year, in Year 2, Kai was awarded the “Principal's Award" for his "love of learning and positive attitude". 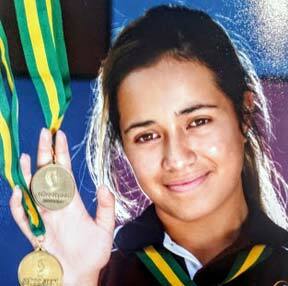 Kai’s school Principal says: “Kai is a terrific student and member of our school community”. Brady was born with bilateral talipes (clubfeet), and has endured nine operations and spent more than a year of his young life with his legs in plaster. While an inpatient at the Royal Children’s Hospital in Melbourne, he noticed the lack of board games for patients. Once discharged he organised a board game drive at school, which sourced 109 new games for the hospital. For the last three years he has donated his birthday presents to the hospital. Recently he organised a shoe drive, collecting 64 pairs of sneakers to be sent to the Philippines, and this year he is fundraising to give the gift of walking to nine children in Madagascar, who were also born with clubfeet.